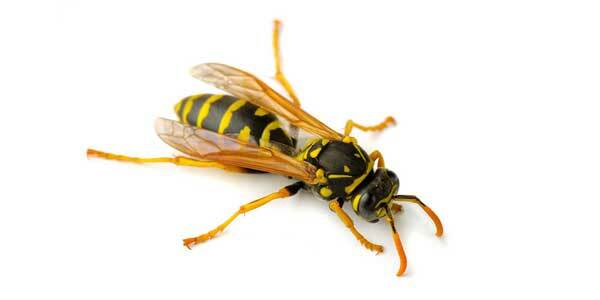 The Paper Wasp is frequently mistaken for a yellow jacket. Smaller than the native northern paper wasp, the dominulus paper wasp is yellow and black, resembling the pattern of the yellow jackets in the genus Vespula. As in all paper wasps, the waist is very thin. During flight, the hind pair of legs trail below in an extended fashion. The nest is the characteristic upside-down umbrella shape, and the open cells can be seen from below. Cream-colored larvae are legless and remain within their cells until they emerge as adult wasps. Fertilized queens from the previous year begin new colonies each spring. These queens hibernate over the winter in protected areas such as under the bark of dead trees. Although most nests are newly constructed each year, the queens will sometimes use a previous year’s nest, thereby establishing their colonies earlier in the season.